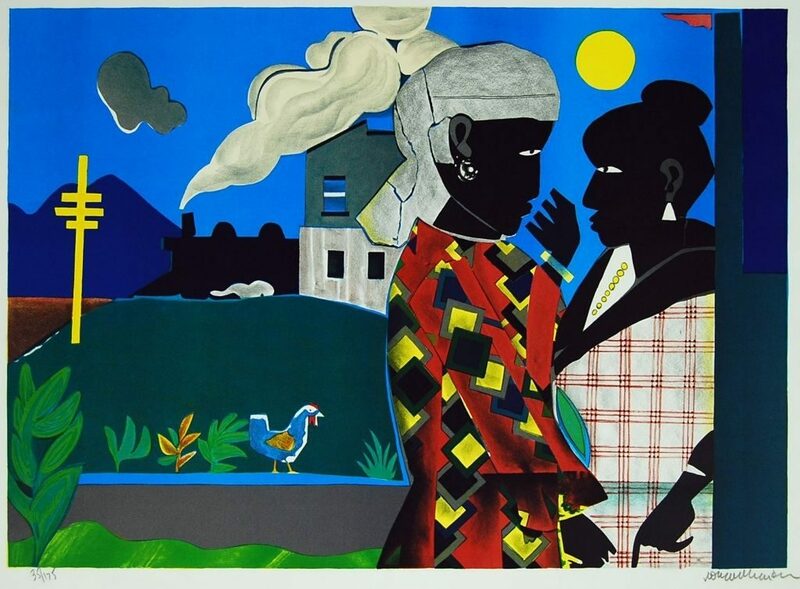 Romare Bearden is regarded as one of America’s master painters and collagists. Bearden is known as an innovator, integrating many techniques to achieve his unique style of collage. His childhood memories and art historical influences are blended and transformed to create an original and exciting narrative on African-American history and the dynamic world of jazz. He is famous for his collages and assemblages mixed with over-paint, and is highly regarded as one of the century’s most inventive print makers, in a league with Charles White and Jacob Lawrence and in the line of Picasso, Braque and Robert Rauschenberg. 1965-66 Corcoran Gallery, 1st solo museum show, Washington, D.C. The Art of Romare Bearden, the most comprehensive retrospective ever assembled of the large and diverse body of work by one of America’s preeminent 20th-century artists, will be presented by the National Gallery of Art in its East Building, September 14, 2003 – January 4, 2004. Approximately 130 works–paintings; drawings and watercolors; monotypes and edition prints; collages of diverse materials, including fabrics; photographs; wood sculpture; and designs for record albums, costumes and stage sets, and book illustrations–will explore the complexity and scope of the artist’s evolution and will feature many rarely exhibited and/or never before reproduced works from private collections. Organized by the National Gallery of Art, the exhibition will also be seen with slight variation at theSan Francisco Museum of Modern Art, February 7 May 16, 2004; the Dallas Museum of Art, June 20 – September 12, 2004; The Whitney Museum of American Art, New York, October 14, 2004 – January 9, 2005; and the High Museum of Art, Atlanta, January 29, 2005 – April 24, 2005.